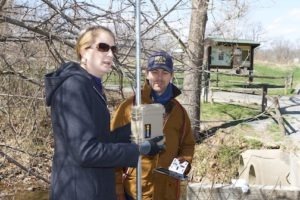 Virginia Working Landscapes and The Downstream Project hosted a do-it-yourself environmental sensor workshop funded by the U.S. EPA, April 4–5 along the Shenandoah River in Clarke County, Va. Participants learned to build and use the open-source, Arduino-based real-time environmental monitoring systems, which offer individuals, communities, and organizations a low-cost alternative for monitoring water quality, quantity, and climate. The workshop was taught by the Stroud Water Research Center, a nonprofit group working to advance knowledge and stewardship of freshwater systems through research, education, and watershed restoration. Participants got a crash course in watershed science along with an introduction to Arduino-compatible hardware, software, programming and sensors. Then they learned to build, weatherproof, deploy, and maintain a monitoring station that collects real-time data that can be uploaded remotely or through memory cards. Thanks to Shenandoah University for opening up the River Campus at Cool Spring Battlefield to this event! For information about do-it-yourself monitoring visit https://envirodiy.org/.